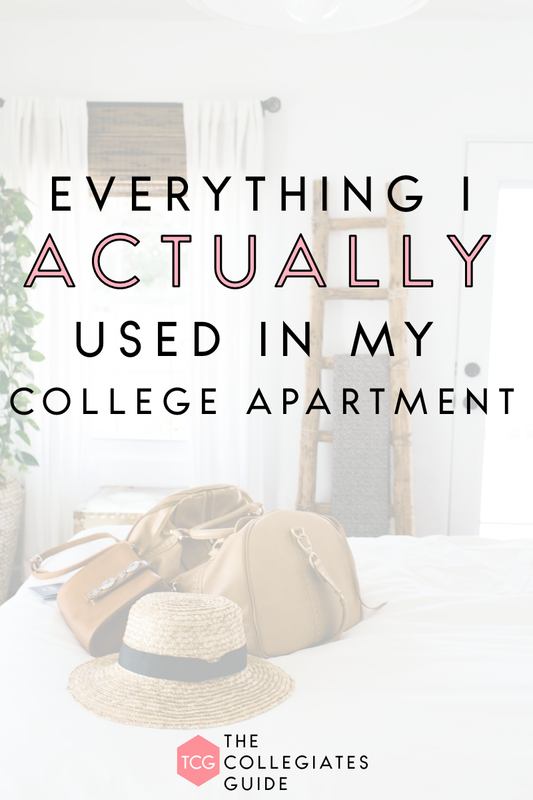 One of my most popular posts from The Collegiate’s Guide happens to be my Extensive Dorm Packing List for College Freshman. I’m glad that it’s been helpful for so many people as they head off for their first year of college. After my freshman year, I moved out to an off-campus duplex. Not exactly an apartment, but a similar concept. Those three years in the duplex with my three roommates were some of the best years of my life so far, and I like to think that part of it was the way we set up our place. Our duplex was unfurnished, but fortunately, my roommates were thrifty and I had a bunch of furniture that I inherited from family (basically, we’re hoarders for those “just in case” moments). Many people don’t realize the amount of stuff that goes into finding an apartment and ensuring that you have everything you need in order to maintain it, furnished or unfurnished. But it can be overwhelming trying to figure out what all you need. So after many requests, I have created a complete college apartment packing guide for my upperclassmen friends in need. This list includes furniture. This list is designed to provide guidance as you shop for your apartment. If you’re living by yourself, lucky you! You have free reign with the design. If you have roommates, be sure to consult them on the color scheme and to share the load in furnishing the place. They might already have some things on the list, so you don’t have to buy them! Lamps - both floor lamps and table lamps. TV + Roku/Amazon FireTV - I have an Amazon FireStick and my parent’s have a Roku Express. Both are great! TV stand - I have this one in my room right now, and love it! Diffuser & Essential Oils - I've swapped all of my candles for essential oils and diffusers and haven't looked back! These are the oils I use. Bed - I upgraded to a full sized bed after that twin in the freshman dorm! Sheets - These are my absolute favorite brand at a reasonable price! Curtains - especially the black out curtains so you can sleep in! Diffuser & Essential Oils - Again, I use these all the time. These are the oils I use. Pots/Pans - This is an affordable, good quality set! Rug for in front of sink - love this one for a clean and classic look! Paper Towels - A great natural line! Regular Plates - How cute are these? Hanging Shower caddy/shelf - the Command line is seriously my favorite thing. Bathroom cleaner - Here’s a great natural line! Toilet cleaner - literally the best toilet cleaner I've found. Plus, it smells great! Bath Mat - I have a round one, but if I were shopping right now I would buy this! Disinfectant spray - Again, a great natural line! Vacuum - Check craigslist or another site where you can purchase a used one. They’re EXPENSIVE. This list doesn’t include decorative items or specifics, but this is a great starter list for those of you who don’t know where to start! I hope this is helpful for those of you who are moving into your new apartment! GET YOUR FREE DORM PACKING CHECKLIST TODAY! By opting in, you are volunteering to submit your first name and email address to receive this resource along with other college-related resources. © 2018 The Collegiates' Guide. All Rights Reserved.